“I am honoured and excited to be coming to St Helena, Ascension and Tristan da Cunha at this unique period in the islands’ histories. I recognise it is a time of lasting change as well as one of some uncertainty. 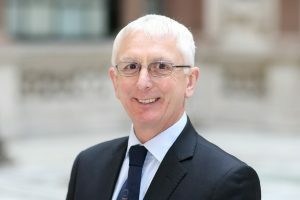 I look forward to working closely with the governments and communities in St Helena, Ascension and Tristan da Cunha to build a confident view of the future for the islands’ inhabitants, to make the most of the economic prospects available, and to safeguard their unique characters and natural beauty. “On St Helena, I intend to support the government and the island to make the most of the possibilities offered by the airport, an emergent business sector, and the much anticipated arrival of the fibre-optic broadband cable. “On Ascension I plan to assist the administration in clarifying the island’s future direction, whilst taking a particular interest in getting the runway and infrastructure improvements completed as swiftly as possible. “On behalf of St Helena I would like to thank and congratulate Governor Honan for her most distinguished service as Governor of St Helena. We offer her and her husband Dave our affectionate good wishes for a happy but less hectic time in the period ahead.